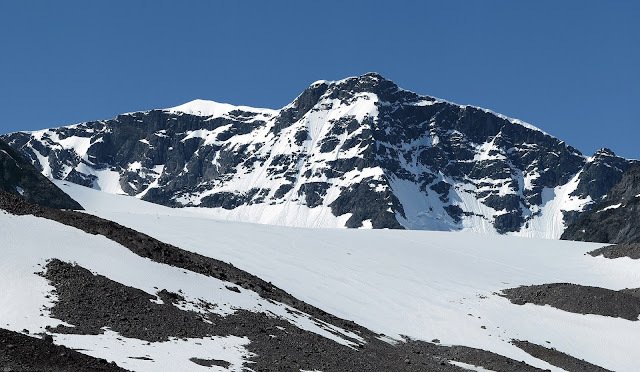 A glacier on the southern tip of Sweden's Kebnekaise mountain has melted so much that the height of the peak has shrunk, and it's no longer the country's tallest, scientists said this week. The announcement came Wednesday in a press release declaring the mountain's northern tip as the nation's new tallest peak. From July 2 to 31, the southern tip lost 13 feet of snow to melting as much of Scandinavia baked in searing heat. "This is happening very fast," Stockholm University geography professor Gunhild Rosqvist said in a statement. "The result of this hot summer will be a record loss in snow and ice in the mountains." The news came after scientists measured both peaks and found the southern tip measured 6,880 feet above sea level, less than a foot taller than the mountain's northern peak. At the time the measurements were taken, the scientists said the northern tip would surely be taller by Aug. 1, and the next time they measure, it'll become official. Last year, the southern tip was 6.5 feet taller than the northern tip at Kebnekaise, the release also said. But according to Stockholm University, the glacier on the southern tip has melted more than 3 feet per year for the last two decades. "I've never seen this much melted snow on the southern peak as I did this summer," said Rosqvist. The snowmelt has been so rapid because of soaring temperatures that set all-time records in some parts of Sweden. North of the Arctic Circle, the village of Kvikkjokk recorded an all-time high of 90.5 degrees Fahrenheit in July, and other areas recorded temperatures in the 90s in Scandinavia, previously unseen heat for any time of year in the region. The news came as researchers from numerous countries came together for an IPCC meeting in China, according to GlacierHub. The goal of the meeting was to give the scientists a chance to compare research and discuss ideas for future studies of the world's glaciers, the report added.